Located on Amelia Island, Egans Creek Park, or Greenway is an area of over 300 acres filled with trails for runners, walkers and bike riders. The location is in the center of Amelia Island, but I would have never known that the trails were there because it is located directly behind a hotel, The Residence Inn. The trails are suitable for almost any fitness level – I would say that it is more of a relaxed walk, but I do not recommend this trail for anyone that has difficulty walking for a good period of time. Bring a jacket if it is on the cool side because the trails are very shaded, pretty much the entire way. It would be the perfect shaded walk in the summer! 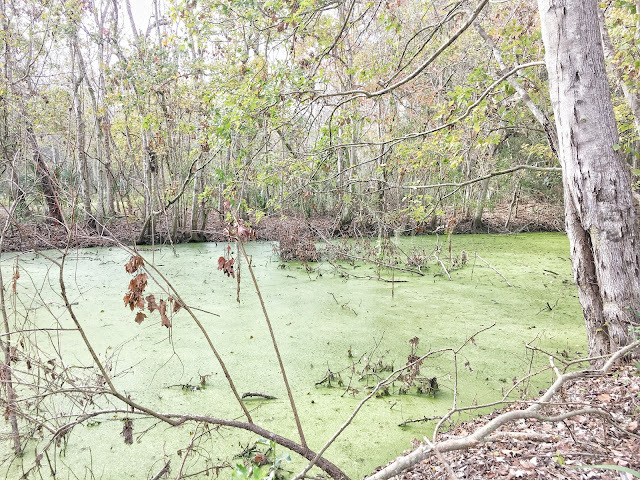 Egans Creek Park is filled with grass lined trails, ponds and streams and wildlife throughout. If you are lucky, you might see tropical birds, turtles, or even alligators. While we were there, we saw birds, turtles, lizards, and a crazy spider, but no alligators. Overall, this is a great option for a fun “nature walk” that you can do with the entire family, and I definitely recommend it!